On this page, you will learn How to change Eclipse IDE theme? Eclipse is a very advanced integrated development environment (IDE) and loaded with lots of features. Even it provides many inbuilt themes for different types of users. It also supports third-party (external) these also. If you are a Java developer or back-end developer, you probably like dark theme and if you are a UI/UX or front-end developer you must like the white theme or classic. 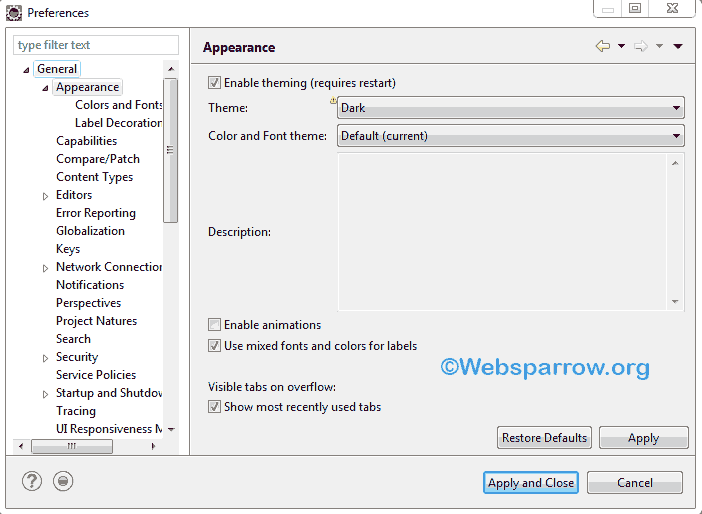 The dark theme in Eclipse or any other IDE help eye fatigue from video glare is reduced, colors, when used to convey information like syntax highlighting, might be easier to notice against a dark background and many other benefits of using a dark theme. Note: I have used Eclipse Oxygen 3 to demonstrate in this tutorial. Your version may contain a different theme. Follow the below steps to change the theme of your Eclipse IDE. Step 1: Open your Eclipse and click on Window » Preferences. Step 2: Expand the General and click on the Appearances. Step 3: Select the theme from the dropdown list. Step 4: Click on the Apply and Close. Step 5: To get affected, restart your Eclipse IDE.